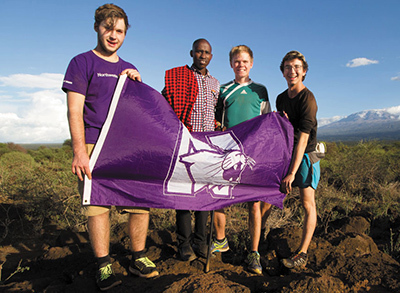 Members of Northwestern's Chapter of Engineers Without Borders USA take its commitment to solve the world's most pressing problems personally. Although landlocked, Los Llanos, Guatemala has become like an island. Located just 19 miles south of the country’s capital, the village has become virtually inaccessible thanks to deteriorating roads and a mammoth, 50-foot-deep ravine. 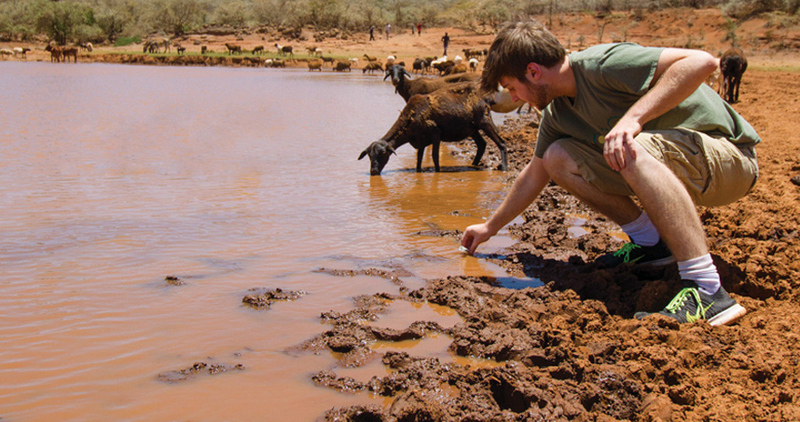 “The ravine has isolated Los Llanos from commerce, travel, and trade,” says Northwestern Engineering senior Jacob Morgan, president of the University’s chapter of Engineers Without Borders (EWB-NU). True to the organization’s mission, EWB-NU students are working with village community members to build a vehicular bridge that will reconnect Los Llanos with the rest of the world. Founded in 2001, Engineers Without Borders USA is a national organization that pairs groups of students and professional engineers with communities, many in the developing world, to pinpoint their needs and implement engineering solutions that improve lives. Northwestern’s chapter, which began with a small group of students in 2013, has since grown to 30 members, 25 of whom are engineers. “We do a lot of research to identify underlying needs,” Morgan says. “We meet with community members in churches and in their homes and work with them on solutions. We want to make community members feel happy and empowered when we leave.” Morgan notes that mistakes made by others in the past have reinforced the wisdom of adopting this collaborative strategy. As an example, he recalls that another organization, having observed the women of an African town walk two miles to fetch water, built a water pump in the town’s center. When the organization’s well-intentioned members returned a year later, they discovered that the pump had gone unused. Learning from the experiences of others, EWB-NU has accepted the challenge of applying its signature community-minded approach to the bridge project in Guatemala with guidance from David Corr, clinical professor of civil and environmental engineering. A team of students will make its first visit in December to assess the ravine and determine the optimal location for the bridge to best meet the community’s needs. EWB-NU launched its first—and ongoing—project in Kenya. The group has made five trips to Kimuka, a small Maasai village just outside Nairobi, to work on a clean water project. Prior to the group’s involvement, villagers drank and used water from small ponds in which animals also bathed. During their first assessment trip, students tested the water and discovered E. coli and other types of coliform contamination. Up to 60 percent of the village children require monthly doctor visits as a result of ingesting these potentially deadly bacteria. Not only is the water dangerously contaminated, it’s in a remote location. Families often travel up to three kilometers each day just to reach these small ponds formed by surface run-off and rainwater. Three years ago, to help alleviate the problem, the Northwestern team implemented a water pump, which they quickly realized only introduced new complications. The pump lacked the power required to extract water from a three-kilometer-deep well. When the team installed a booster pump to solve that problem, the cost of water quintupled, making it unaffordable for community use on a regular basis. Subsequently, the team met with the community water committee, electricity company Kenya Power, and other individuals to gain a more comprehensive understanding of the problem. Then they put their engineering skills to work. They ran new calculations to find the exact pressure the pipe could handle, the amount of electricity it could draw, how quickly it could fill the tank, and how best to reduce costs. When the team returns over spring break in March, it will continue to work on an optimal solution. Although it might take several more years to complete the bridge in Guatemala and to fully perfect the water pump in Kenya, EWB-NU is actively working to fulfill other goals closer to home. Group members participate in a mentorship program with Chicago Public Schools, making weekly visits to Frank W. Reilly Elementary School to discuss science and international aid. This year, EWB-NU helped the school’s students design cities for the Chicago Future City Competition. Two of the teams won special awards for best education enhancement, excellencein mobility technology, and water resources.